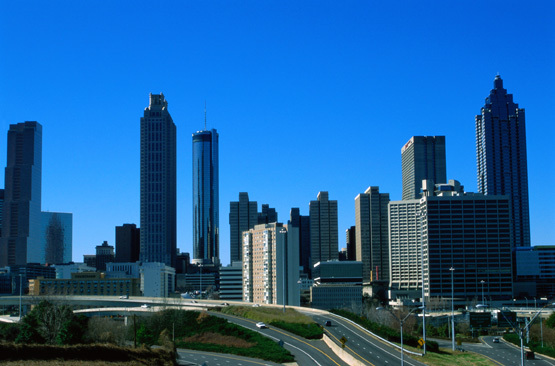 Atlanta, Georgia, is a bustling, world-class city, with a skyline full of impressive architectural designs that complement rolling hills and abundant foliage. Atlanta is consistently ranked as one of the best places to do business in the U.S., and more than 750 of Fortune's Top 1,000 businesses have offices there. The Atlanta airport (Hartsfield-Jackson) is usually ranked as the world's busiest, and its airport code, ATL, has become the city's nickname among locals. Atlanta's fast-paced, ready-for-the-future attitude is evident in its booming convention business. Other Atlanta attractions include pulsing nightlife, showplace museums, sophisticated fine-arts facilities and painstakingly restored historical landmarks. Downtown Atlanta has several hubs of activity. Encircling Centennial Olympic Park is the Georgia World Congress Center convention facility, CNN Center and the Georgia Aquarium. A few blocks away, Peachtree Center is a cluster of grand hotels, retail shops, restaurants and business towers. Cultural events downtown include concerts in Centennial Olympic Park and a range of presentations at Woodruff Arts Center and Georgia State University's Rialto Center for the Performing Arts. One of the most exciting recent additions to the downtown landscape is the Atlanta Streetcar, which currently makes a 2.7-mi/4.3-km loop throughout downtown and the Sweet Auburn district, with an expansion planned for the future. Just a few miles/kilometers away, the city's progressive sights and sounds evolve into quiet dogwood- and azalea-lined streets. Residents of historic, in-town Atlanta neighborhoods, such as Buckhead and Virginia-Highland, enjoy restored homes, baby-stroller-friendly sidewalks, unusual antiques shops and art studios, and intimate, cozy outdoor cafes.